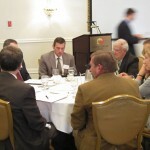 The Central New York Regional Planning and Development Board hosted the third meeting for the Vision CNY Regional Sustainability Plan on Wednesday, October 17th at the Genesee Grande Hotel, Tiffany Ballroom. The meeting featured a brief presentation on the status of work being conducted by CNY RPDB staff for Vision CNY. 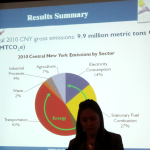 In addition, CNY RPDB Board members and guests were invited to participate in a small group dialogue during which the draft goals, strategies, and project recommendations for the sustainability plan were reviewed. 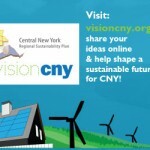 The CNY RPDB held the second in a series of meetings for the Vision CNY Regional Sustainability Plan on Wednesday August 15th at Morrisville State College. 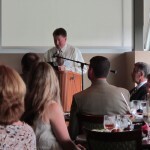 The meeting featured a review of major developments in Madison County by Scott Ingmire, Director of the Madison County Planning Department, a report on the status of the CNY RPDB’s work on the Regional Sustainability Plan, and a guest presentation by Dr. Phil Hoffmeyer, Assistant Professor of Renewable Energy at Morrisville State College, on the college’s Renewable Energy Training Center (RETC). Following the meeting, participants had a guided tour of the College’s Controlled Environmental Aquaculture Center. 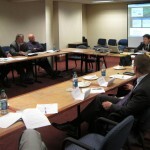 The CNY RPDB hosted the second meeting of the Vision CNY Technical Advisory Committee (TAC) on August 2nd, 2012 at the offices of O’Brien and Gere, 333 West Washington Street in Downtown Syracuse. The meeting offered TAC members information on preliminary findings from the O’Brien and Gere consultant team. CNY RPDB staff also provided an initial draft of goals and strategies for the plan. The CNY RPDB hosted the first meeting of the Vision CNY Technical Advisory Committee (TAC) on Tuesday July 10th, 2012 at its offices in Downtown Syracuse. The meeting provided on overview of the role of the TAC in the planning process, the anticipated meeting schedule for the committee, and the proposed timeline and scope for the development of the Regional Sustainability Plan.